I typically bake tofu early in the week then refrigerate it to add to meals during the week. 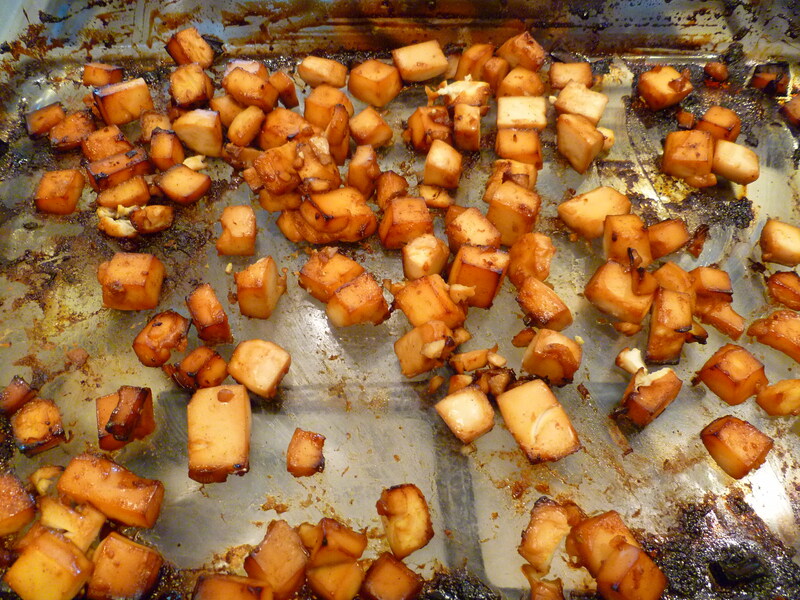 A typical recipe for baked tofu will normally call for you to drain and press it, then marinate for an hour or so. 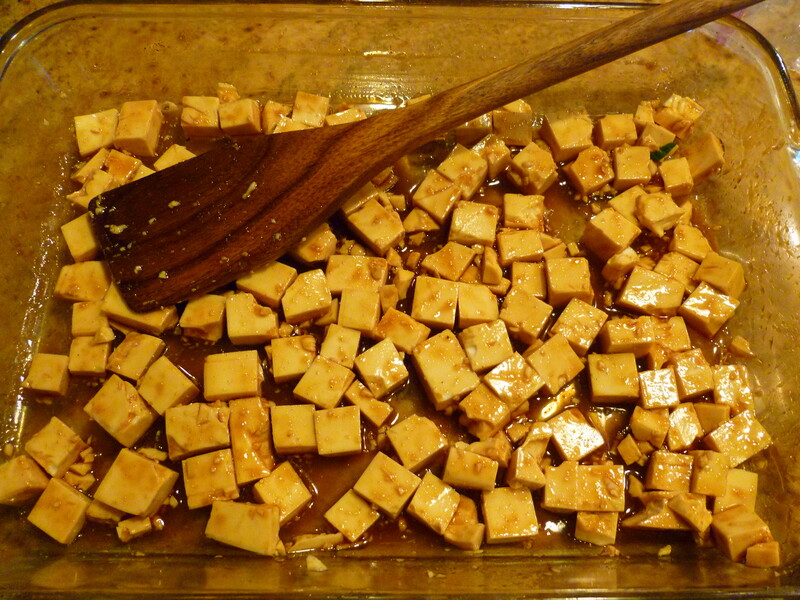 However, I rarely have time for that so I simply drain the tofu, chop in into large cubes then toss it in a large glass casserole dish. 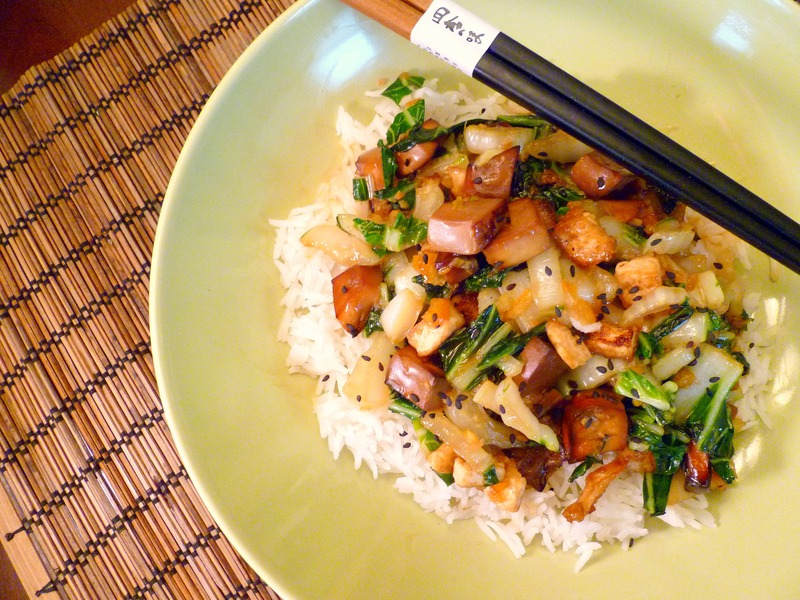 I take my favorite Teriaki sauce (Yoshida’s Goumet Teriaki) and pour just enough to coat the tofu. I gently toss it until it is all coated then pop it in the oven at 375 degrees for one hour. Because you are baking the tofu with the sauce, you need to stir the tofu about every 15 minutes, flipping it over if possible. 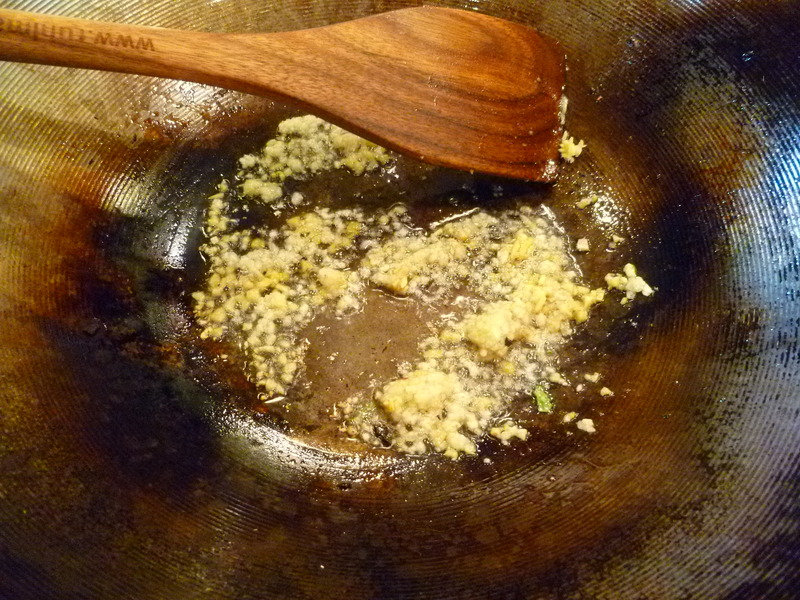 The pan will come out fairly crusty (see pic) but if you keep the tofu stirred, it won’t be burnt or sticking to the pan. Because it wasn’t pressed, the water content keeps it moist enough from sticking. 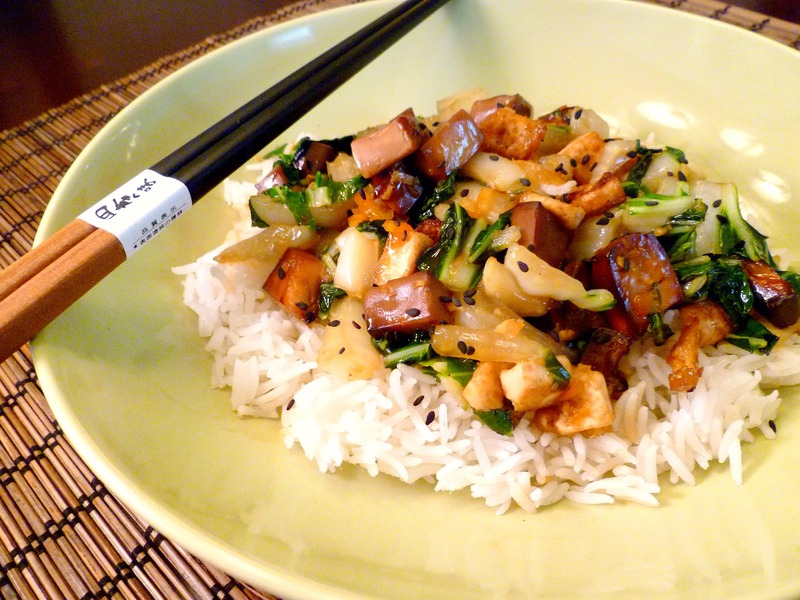 The end result is a nice chewy tofu with an outer layer similar to fried tofu… but better for you! Refrigerate left overs and use in stir frys, salads or any recipe that calls for baked or fried tofu. If you do not have toasted cashews, toast raw unsalted cashews by heating the oven to 350 degrees. Spread the cashews on a rimmed baking sheet and cook for 10-15 minutes or until cashews are lightly browned. Remove from oven and set aside. Meanwhile, whisk together the marmalade, tamari, water and corn starch. Set aside. Heat wok over medium to high heat (I have high output burners so I find I have stir fry over medium or my stir fry burns. Usually, though, high heat is best for stir fry’s). Add oil then add garlic and ginger. Stir fry about 1 minute then add baked tofu and red pepper flakes. Stir fry 2 minutes then add cashews and bok choy. Stir fry until bok choy starts to soften then add half the marmalade sauce. Cook for about 1-2 minutes then turn off heat. Immediately plate stir fry over rice or quinoa, dividing portions evenly. Add the rest of the marmalade to the pan for a minute to quickly warm. Then drizzle evenly over the top of all portions OR put into a small dish to serve with the meal for others to spoon extra on to their stir fry or rice. Sprinkle sesame seeds on each dish if desired. Footnotes: When you cook with high temperatures, you must stir constantly. Make sure to have all your ingredients chopped and ready to go. Once you start the stir fry, this whole dish will be ready in 5 minutes. My most useful tool for a stir fry, other than the wok, is a splatter screen. You can buy them really inexpensively at any general store that sells housewares. I found a set of 3 that are round shapes of varying sizes for less than $10 for the set. I keep the screen over my wok the whole time and when I add ingredients. I lift it up at an angle so my face and arms are still protected. Hot oil splatter can be very dangerous, especially if it gets in your eye! Baby bok choy works really well here because it has more greens to the white ratios. 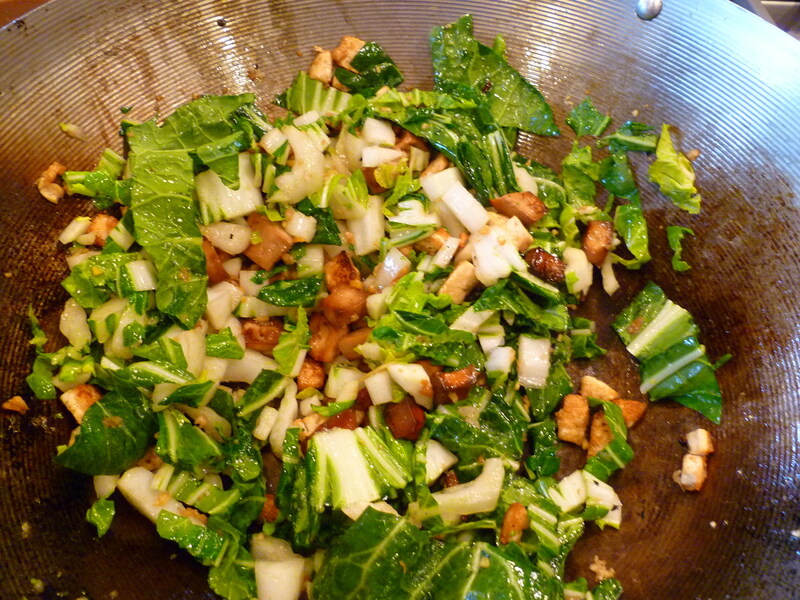 If you buy regular bok choy, chop up all the greens and only part of the whites. About 3 parts greens to 1 part whites works well. Otherwise you will end up with a ton of the crunchy white part of the bok choy. It’s not a terrible thing, it will just make the consistency of this meal much different. The reason I don’t put all the sauce in the pan at once is because it would really weigh down the bok choy and make it soggy. Only use half! Then when you have dished all the stir fry out, quickly add it to the pan (which will be turned off, but will still be hot). As you set out your dishes on the table, the sauce will be warming. Immediately put it into a serving bowl to drizzle over the stir fry as each person individually prefers. Looks fantastic and very delicious! Thanks for sharing! This looks so fresh and delicious..great recipe.